“Keto” is booming! But there is still a lot of confusion about what exactly constitutes “optimal ketosis”. Most of the magic of ketosis occurs when you burn your own body fat rather than eat more dietary fat or consume exogenous ketones. If your goal is weight loss or diabetes management, chase lower blood glucose levels, not higher ketone levels. Our bodies switch to burning more fat via ketogenesis when we eat less digestible carbohydrates and protein available. While many people get caught up chasing ‘optimal ketosis’, anything above 0.2 mmol/L with lower blood sugar levels is a sign that your insulin sensitivity and metabolic health is improving. Eating ‘fat to satiety’ on a low carb or ketogenic diet can help you achieve ‘non-diabetic’ blood sugar levels. However, some degree of self-discipline may still be required to achieve optimal health and desirable body fat levels. 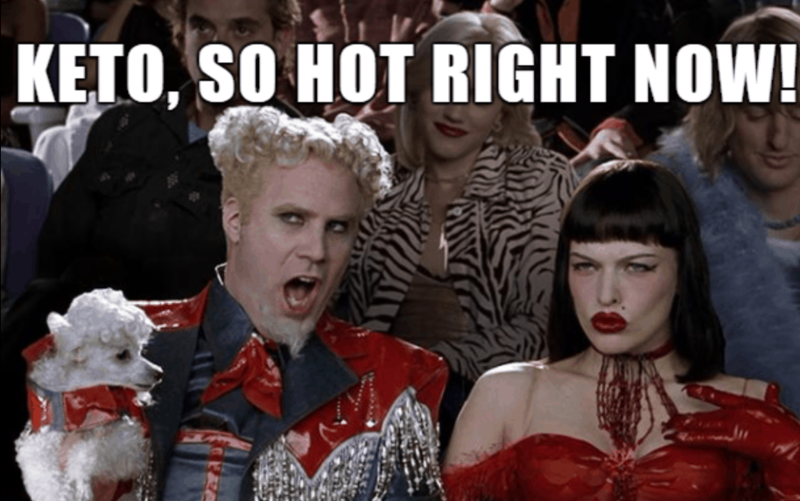 Keto is so hot right now! Every woman and her cat seem to be getting on the keto bandwagon. Whether it be cookbooks, Facebook groups or forums, keto is booming! If everyone else is getting on the keto train then surely you need some? And more must be better? If you’re not doing it yet then maybe you’re missing out? Or like every exponential trend, is there a crash just over the horizon? Like tulip bulbs in the 1630s? Or perhaps Bitcoin right now? Personally, I’ve had a keen interest in ketosis for a while. I was into keto before it was cool. I followed Dave Asprey’s Bulletproof coffcoffeeze. I even bought a bunch of his expensive mycotoxin free beans. I eagerly followed Jimmy Moore’s updates during his n=1 ketosis experiment during 2012. I was so eager to follow in his footsteps as soon as I could! I got hold of Keto Clarity as soon as it was released. I started adding butter and MCT oil to my coffee and eating liberal amounts of cheese, cream and coconut products in an effort to get my ketone values into what I understood to be the “optimal ketone zone”. I spent a good chunk of money on strips to test my blood ketones regularly to see if I was achieving ‘optimal ketosis’. Calories and energy balance didn’t matter. But unfortunately, I wasn’t one of the blessed that could ‘eat fat to satiety’ and be as lean and healthy as I’d hoped. The picture below is my work profile shot a year or so after chasing higher ketones with more refined dietary fat. I was as heavy as I’d ever been, had early signs of fatty liver and prediabetes. I realise now that I had been trying to drive exogenous ketosis with lots of extra dietary fat. What I really needed was to learn how to achieve endogenous ketosis to burn off my unwanted body fat. My quest to understand what went wrong has taken me on a fascinating journey in an effort to manage my own health as well as to understand how to assist my wife Monica better manage her type 1 diabetes. In this post, I hope to share some of my learnings and insights to help people get what they really need from their keto journey and avoid the common pitfalls. I recently had the opportunity to pose some of my most pressing questions about optimal ketone levels and protein intake to the Godfather of Keto, Dr Stephen Phinney in a recent Facebook live Q&A. Dr Phinney addressed one of my questions in the live broadcast as well as responding in writing in writing on the Virta blog. I have included my question on optimal ketone levels and Dr Phinney’s response below along with my own additional thoughts. But first, I think it’s important to understand what ketosis actually is. Ketosis occurs when there is a lack of Oxaloacetate from non-fibre digestible carbohydrates and protein to enable fat to be oxidised in the Krebs cycle. When Oxaloacetate availability reduces, the body produces Acetoacetyl CoA and Acetoacetate (AcAc) via ketosis. You can also think of this in terms of insulin load. That is, when the net carbs and protein in the diet are reduced we switch to burn more of our fat via ketogenesis rather than in the Krebs cycle. I used to think that we were only burning fat when via ketosis, but I now understand that’s not correct. Ketosis is just how we burn fat when the Kreb cycle can’t operate normally. Ketosis is an important biochemical process that allowed us to survive through times when food was scarce. As described by Dr David Sinclair in this video, lots of good things happen during periods of low energy availability (e.g. increased autophagy, AND+ and SIRT1). Our bodies go into emergency repair mode to increase our chances of being around to procreate in future times of plenty. Energy restriction is the only thing that has conclusively been proved to promote longevity in humans. But it’s hard, so it’s not very popular. When food is available, left to our own devices, our bodies tend to store up a little extra fat for the winter. Unfortunately, in our modern environment, winter never comes. If your NAD+ levels are lower, more Acetoacetate (AcAc) will be converted to Beta-hydroxybutyrate (BHB) in the blood. If your NADH+:NADH ratio is high there will be more Acetoacetate in circulation. Acetone can be thought of as the vapour that is released from Acetoacetate. So, if less Acetoacetate is being converted to BHB, you will register higher breath ketones. Chris Masterjohn explains this in more detail in this video. Reduced NAD+ levels are associated with ageing, and increased NADH levels are associated with over fueling and diabetes. Thus, high levels of BHB and low levels of breath acetone are not a good sign. You may be interested to know that fat loss from the body is better correlated with higher breath acetone levels rather than ketones in the blood. Personally, I find when I take Niacin supplements (vitamin B3 increases NAD+) my BHB plummets and my breath acetone skyrockets. In summary, the amount of beta-hydroxybutyrate in your bloodstream at any point in time is influenced by the amount of fat ingested, your NAD+:NADH ratio as well as the rate at which they are using BHB. What are normal ketone levels? We all like to compare others to others to understand if we are normal. I thought it would be interesting to crowdsource some data to understand what normal ketone levels are in people following a low carb or ketogenic diet. I wanted to understand if everyone was struggling to reach the ‘optimal ketone zone’ like I was. The chart below shows the compilation of more than three thousand blood ketone and glucose data points crowdsourced from people following a low carb or ketogenic diet (with particular thanks to Michel from Ketonix for the anonymous data). Ketone values are shown in blue on the bottom and glucose is in orange on top. Someone with uncontrolled type 1 diabetes will have a very low NAD+:NADH ratio and hence very high levels of BHB (i.e. greater than 8 mmol/L). This is termed “ketoacidosis” and is accompanied by very high blood glucose levels. Someone with uncontrolled type 1 diabetes would be off the chart to the right. High levels of BHB are dangerous because they are acidic. However, people who do not have Type 1 diabetes typically have blood ketone values less than 4.0mmol/L. People with a functioning pancreas do not need to fear acidic ketones, particularly if they are sitting to the left of this chart with lower levels of energy floating around in their blood. You can think of our bloodstream as our metabolic highway that helps get the energy to the cells that need it. We want enough energy in the blood to fuel the body, but not so much that a traffic jam occurs. Really high levels of glucose in the bloodstream lead to glycation. Similarly, high levels of free fatty acids lead to oxidised LDL which increases your risk of heart disease. If your bloodstream is full like syrup with excess glucose, ketones and fatty acids then the energy and nutrients can’t get where they need to go. Your kidneys will be working overtime clearing out the nutrients from the blood that your body does not require. Your body raises insulin in an effort to stop energy flowing out of storage while you are still using up the energy in your blood. When your bloodstream is clogged with energy there will be no opportunity for the body to cleanse and undertake autophagy. Detoxification won’t be able to occur as effectively, and your fat stores will continue to build up toxins. I now realise where I went wrong in my early keto journey was that I didn’t understand the difference between exogenous and endogenous ketosis. I now realise that I was trying to address my pre-diabetes and obesity with a classical or therapeutic ketogenic diet which is intended to be used for epilepsy, cancer, Alzheimer’s, Parkinson’s and dementia. All this excess energy was just exacerbating the situation I was trying to solve. The chart below shows the blood glucose and ketone levels during exogenous ketosis. While glucose may not be high, but we have high levels of ketones and likely higher levels of triglycerides in the bloodstream largely from external sources. This may be helpful in a situation such as epilepsy, Alzheimer’s, Parkinson’s or dementia where glucose is not being processed efficiently by the brain. Excess glucose is thought to fuel the growth of some cancers, so reducing glucose and increasing ketones enables us to fuel the brain while not feeding the cancer cells. The chart below shows what happens in endogenous ketosis. In fasting or energy restriction your blood sugar will decrease. As you can see from this chart, your blood ketones may not be as high due to your high NAD+:NADH ratio and the fact that you are not pushing in large amounts of external fat. Ketones will also be used for energy rather than building up in the bloodstream. In this lower energy state, your body will be pulling fat from your belly and bum to offset the deficit of energy from glucose and ketones in the bloodstream. Your blood will no longer be a congested and the toxins will be able to flow out of your fat stores. Your kidneys will cleanse your bloodstream, and you will excrete the waste that was stored in your fat. You will increase autophagy as you old proteins, and pre-cancerous cells are cleansed and eaten up by your body. Your insulin levels will also decrease, and your fat stores will become insulin sensitive again. Without constant incoming energy, the fat in your pancreas, liver, heart, brain, eyes etc will then be used for energy. You will feel younger and lighter and start to think more clearly! You will effectively be slowing the aging process! Someone managing diabetes and/or seeking weight loss should ideally target a lower overall level of energy in their bloodstream. Having less energy in the blood, whether in the form of glucose, ketones or free fatty acids, forces the body to supply more energy from body fat. The chart below shows the levels of blood ketones that relate to higher and lower levels of glucose and ‘total energy’ from glucose and ketones. The three thousand blood ketone and glucose levels have been divided into five ‘bins’ based on their total energy content. The smallest is shown on the left with the largest total energy shown on the right. This data suggests that good metabolic health is characterised by not having excessive levels of energy floating around in the bloodstream. Lower glucose levels tend to correlate with lower blood ketones. The lowest blood glucose levels are associated with a blood ketone level of about 0.3 to 0.7mmol/L. When I recently re-read the paper detailing the results of the first ten weeks of the Virta trial I was intrigued to see that, even though they were targeting ‘nutritional ketosis’ the average BHB level achieved was only just above the cut off for nutritional ketosis. The average BHB was 0.6mmol/L with a standard deviation of 0.6 mmol/L. To better understand what this means, the chart below, many people had ketone levels below the cut off for nutritional ketosis of 0.5 mmol/L. The largest ‘bin’ of ketone values as 0.1 to 0.3 mmol/L. The second largest grouping was 0.3 to 0.5 mmol/L. Dr Phinney’s comment that it was the people with the higher ketone levels that experienced better results in the long term made me think of the relationship between ketones and blood glucose which is also based on the crowdsourced data. In fasting, people who are more insulin sensitive can more easily produce ketones when there is no food, while people with high levels of insulin have high blood sugar levels and tend to have lower levels of ketones as shown in the chart below. So perhaps the people who did the best were the ones that were already more insulin sensitive and thus were able to go longer periods between food, especially once the insulin load of their diet was reduced and their blood sugar and insulin levels came down closer normal levels? At this point, you’re probably confused. Is it even worth testing ketones? And if I do, what values should I be targeting? My conclusion, after doing a lot of self-testing as well as analysis of a lot of other people’s data is that, unless you require ketosis for therapeutic purposes your blood ketone levels probably don’t matter that much. Some level of blood ketones is good to have (say 0.2 mmol/L or more), but more is not necessarily better. And for goodness sake, don’t go chasing higher blood ketones with more dietary fat if your goal is fat loss from your body! For people trying to manage obesity and/or diabetes, ketosis is a fascinating side effect of a lower energy state when you have less carbohydrate and protein to burn. But it is not the end goal. Ketosis is part of the process that occurs as we burn out own body fat. So how do I optimise my blood sugars? A diet with a lower insulin load (i.e. less non-fibre carbohydrates and less insulinogenic protein) will enable someone with diabetes to stabilise their blood glucose levels. They will require less insulin so their pancreas can more easily keep up to maintain healthy blood glucose levels. Stable blood sugars and removal of processed carbohydrates often helps to normalise appetite and spontaneous weight loss. As body fat stores become less full your adipose tissue will become more insulin sensitive and can then absorb the day to day energy flux without needing to spill excess energy into the bloodstream. Because your body fat is doing the job properly, you won’t see high levels of blood sugar in your blood. Your body is always rebalancing your fuel system (i.e. glucose, ketones and free fatty acids) depending on your needs and dietary energy sources. We can store a little bit of glucose in our bloodstream and liver, but the major fuel tank is our fat stores. When our adipose tissue is full and can’t take anymore everything else backs up and overflows. Fascinating recent work by Professor Roy Taylor at Newcastle University in the UK has shown that reducing fat from the vital organs like the pancreas can actually reverse diabetes. Professor Taylor coined the term ‘Personal Fat Threshold’ which is the point at which your adipose tissue can no longer easily absorb the extra energy from the food we eat and starts to send more of it to other places in our body. It’s like our fat storage balloon is full. Once we exceed our personal fat threshold any extra is energy shuttled off to the bloodstream in the form of high glucose, high free fatty acids and higher ketones) as well as the other parts of the body that are more insulin sensitive than our adipose tissue such as our liver, pancreas, heart, eyes, kidney, brain and heart). The problem however with Professor Taylor’s approach was that it was an 800 calorie per day short-term intervention based on Optifast meal replacement shakes. The ideal approach would be to design a nutritious set of foods that would provide the nutrients you need without excessive energy. Many people find that a low carb diet will help stabilise blood sugar levels. However, many, if not most, people find that they need to restrict energy intake and/or increase the nutrient:energy ratio of their diet in order to achieve the blood glucose control and body fat levels that are associated with optimal longevity. This can be achieved through intermittent fasting, time restricted feeding, meal skipping, ‘clean eating’, calorie counting or whatever works for you. Regardless of how you feel about any of these concepts, you need to do whatever it takes to reduce the inputs to the point that you see the energy in your bloodstream decrease. How much discipline and deprivation you want to enforce on yourself depends on how close you want to get to optimal. While it’s good to see your body fat levels reducing, measuring your blood sugar is probably the most effective way to get a cost-effective and immediate understanding of whether you actually need to eat (see How to use your glucose meter as a fuel gauge for more details on this concept). The figures below show the relationship between HbA1c to various symptoms of metabolic disease such as diabetes, heart disease and stroke. All-cause mortality is lowest with an HbA1c of somewhere between 4.5 and 5.0%. Can we achieve optimal in our modern environment? This Australian Aboriginal hunter from more than 100 years ago is my favourite example of optimal metabolic health. Everything he could find to eat would have been filled with nutrients. He wouldn’t have overeaten because he had to hunt or gather everything, and that took a lot of effort. Every year or so he would have had a period of externally enforced fasting when food wasn’t so plentiful. And if he was the fattest and slowest in his tribe he might have been prey to wild animals. Today we like to reminisce about paleo and ancestral times. However, I don’t think we can ever go back to mimic how this guy lived, even if we wanted to. While we can get unprocessed organic fairly nutrient dense foods, we will probably never achieve the food scarcity context that he had. Today food is fairly cheap and easy to get hold of. And whenever when we eat ‘to satiety’ we are programmed by evolution to prepare for a famine on a long boat ride where only the people who could store energy survived. People like to rail against the idea that we might need to limit our energy intake. However, in today’s context, I think we need to work out how to recreate the useful elements of ‘the good old days’ in a modern context. Unless we’re prepared to live in the desert and leave our credit cards behind, perhaps things like periods of fasting to reduce our blood glucose levels, gyms to build strength, energy tracking apps like Cronometer to ensure we are eating nutritious food (and not too much of it) all play a role in our modern context? It’s not going to be a popular concept, but some level of deprivation or self-control may be necessary if you want to achieve optimal health and delay the diseases of aging. It’s OK if you don’t want to go all in and invest everything it takes to achieve optimal health, but it’s still useful to understand how to get even part of the way there. It can be confusing to know how much of each macronutrient you should be eating. Everyone has different goals and circumstances. Over the last few months, I’ve been working with a very talented programmer, Alex Zotov, to develop some handy software called the Nutrient Optimiser to help people navigate all this information and help people put it into practice. The table below shows how we how we segregate people based on their different goals based on your blood sugar levels, HbA1c, waist:height ratio and trigliceride:HDL ratio. From there we can target the most nutrient dense foods and meals while also keeping your blood sugars stable, fueling your activity or help you to lose body fat. If you do have diabetes, then a low carb/keto diet will help stabilise your blood sugars and will often help to stabilise your appetite. But then, as you improve your health you can continue to refine your food choices to and increase the nutrient density of your diet even more. Meanwhile, if you’ve got great blood sugars but want to lose body fat there’s no reason to be eating a super high fat therapeutic ketogenic diet designed to control epileptic seizures. If you want to get some definitive answers about your current diet head over to Nutrient Optmiser where we will help you identify the ideal macronutrient ranges, energy intake and as well as a shortlist of optimal foods and meals to suit your goals. We’d love you to check it and let us know what you think. We hope it will help a lot of people avoid the confusion of keto and move forward towards optimal. To help you out all this theory into practice, we have assembled a range of nutrient dense food lists tailored to different goals. The right-hand column shows the nutrient profile of each food list. Click on the ‘food list’ links below to get a free printable pdf food list delivered to your inbox. This woman AND her cat got onboard about the same time you did…I lost 60 lbs. (all post-menopause), and the cat lost 3 lbs. The flood gates have finally opened, ad this is what you, Jimmy Moore, and other pro-keto folks have been waiting for, as prices for the diabetes self-care items have shot through the roof and are headed for outer space. The general public is starting to wake up to the fact that metabolic diseases are just too costly to simply turn over to docs to manage (if and when insurance is in the picture). Deprivation in any form seems to be the insurmountable feat here–people work for a living, and feel like they shouldn’t be burdened with any kind of brakes being applied to what they shove into their mouths, or even be required to track it for effects to the body. As long as insurance is in the picture, most will just sit back and let the doc break the bad news, the continue to sit back and let some other doc clean the mess up…or try to. What they don’t realize is that doctors get paid whether they succeed with the case or not. We should all play the health game as if health insurance doesn’t exist–as if it’s a giant D-I-Y thing. If we all start taking control of our health FOR OURSELVES, then you will see the cost of insurance, as well as maintenance supplies, come tumbling down. As it is, the health sector of the economy is THE ONLY THING keeping the economy as a whole going–from drug discovery, manufacture, and sales to the invention of illnesses, widening diagnoses, and drug “want creation”. Fantastic blog post, thanks Marty, can’t wait to try your nutrient optimiser. I had a little giggle, however, about a fat ancient human being eaten by a predator – in Australia there are no apex predators. Even the extinct Tasmanian tiger couldn’t kill and eat a human I suspect. And I feel a little uncomfortable with the Aboriginal person stereotype – it’s really not the whole story. Aboriginal people these days are suffering hugely from diseases of colonisation like T2DM, particularly pertinent right now, on the weekend of Invasion Day, (known to some as australia day). Just more complicated. 1) your body will burn the fat you just ate before it burns stored fat so stop eating so much fat. 2) You might lose weight at the start of a lchf keto diet eating all the calories you want… but that won’t last. At some point you have to start matching calories in to energy out. 3) No matter what your optimal goals are (halfway there, 3/4, all the way), at some point you gotta move. And you have to keep moving. Bodies are made in the kitchen but they are maintained by moving. You don’t have to be a gym rat but you have to do something hard every day. 4) And, lastly, my “keto” diet is looking more like Atkins: higher protein, high fat, low carb. Using cronometer to keep it in line, great tool for me. awesome Sally. sounds like you’re on the right track!